On a sunny Monday, at the Landmark Theatre in Ilfracombe, 37 members of the Biosphere's Marine Working Group and the Marine Pioneer's Steering Group gathered to help with the progression of the Marine Pioneer. Referring back to the original long-term goals that the Marine Working Group set in spring 2017, an update was given on progress of the pioneer so far. As well as Pioneer updates, we were fortunate enough to have presentations from other North Devon projects: Dominie Dunbrook (North Devon Council) talked about the North Devon Surfing Reserve Application and the local Watersports Survey; and Claire Moodie spoke about the Plastic Free North Devon initiative. In February over 40 people from the Biosphere's Marine Working Group and the Marine Pioneer Steering Group braved the snow to attend the North Devon Marine Pioneer's 2nd Stakeholder workshop. This was a successful, well attended day with updates on the work carried out so far. Many themes were discussed, including: understanding marine governance; managing the uses of the estuary; sustainable fisheries in Pioneer area; and financing Marine Protected Areas. This work is being used to develop and progress the Pioneer's demonstration projects. ​To find out more - the report and presentations can be downloaded from the link to the right. In November a workshop was held to consider how our natural marine environment (marine natural capital) could be incorporated into local decision making. Discussions focused on two themes: individual developments and strategic planning of marine areas. The workshop brought together local and national representatives from organisations that are involved in decisions about the marine environment, with some clear guidance on how and where natural capital can be incorporated and what is needed to help this happen, examples are, guidance notes on natural capital and ecosystems services, mapping of ecosystems services and natural capital. The first South West Marine Natural Capital Conference 2017 was organised and hosted by the Devon Maritime Forum with North Devon Marine Pioneer the SWEEP project (Plymouth University, Plymouth Marine Laboratory and University of Exeter), and the UK SEAS project (WWF). The conference provided an excellent opportunity for leading practitioners, businesses and interested stakeholders to learn more about natural capital, the Natural Capital Approach, and the region’s marine and coastal assets; as well as finding out how they could get involved with the three partnership projects that are currently commencing in the region - the South West Partnership for Environment and Economic Prosperity (SWEEP), the North Devon Marine Pioneer, and WWF - UK SEAS project. Over 150 people attended the event, from a range of professions and interests. The day was lively and informative with delegates getting involved through participation in workshops and round table exercises. The conference will be used to help guide work within the Marine Pioneer, SWEEP and WWF - UK SEAS projects. The presentations from the day can be found on the Devon Maritime Forum website. 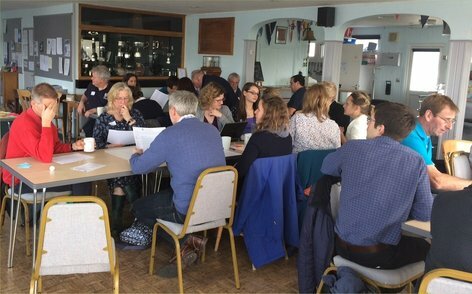 ​A very well-attended stakeholder meeting of the Marine Pioneer stakeholders took place at the North Devon Yacht Club in Instow. It was a major step forward in setting the vision for the Biosphere marine area and the project.